The Canadian Country Music Association (CCMA) has named Don Green Executive Director of the Association. Green starts at the CCMA on Monday, August 23 and will be onsite at Country Music Week Edmonton, September 8-12. Current interim Executive Director, Sheila Hamilton will remain on staff through the Fall to ensure a flawless transition. Green is currently the VP of Operations of Puretracks (division of Somerset Entertainment), a leading North American digital music provider and holds a Bachelor of Commerce degree from McMaster University. Prior to Puretracks, Green gained extensive business and leadership experience at Bell Canada in a diverse range of senior management roles, including marketing, sales, public relations, and strategic planning. “I look forward to working with all key CCMA stakeholders to deliver the mandate of the Association,” Green said. “It’s an honor to work within a genre that I have listened to and loved since my childhood. 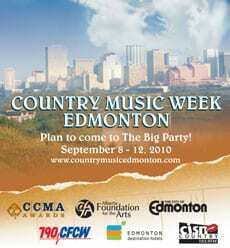 For more information about Country Music Week 2010, the Canadian Country Music Awards or the CCMA visit www.ccma.org.